One of the joys of blogging is you sometimes get sent things to review that you would definitely love to have bought anyway, and the Kitcentric Classic University Student Kit is a perfect example. It’s a really excellent gift for a godparent, aunt, uncle or grandparent to give to make some lucky student’s day. 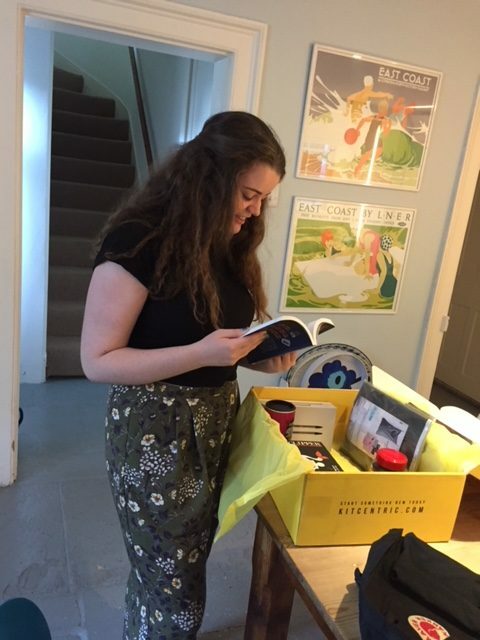 Going off to uni is such a seismic event in a young person’s life, and this happy box is a lovely taste of all the good things in store, with some of the reassurance of home built in. We were sent the Classic University Student Kit which retails at £65. The jaunty yellow box is quite unmissable and opening it is already an exciting event, before you’ve even seen what’s inside. Everything is swathed in layers of bright yellow tissue (which I will definitely be recycling to wrap presents in for the next year or ten) and underneath that is all the good stuff. 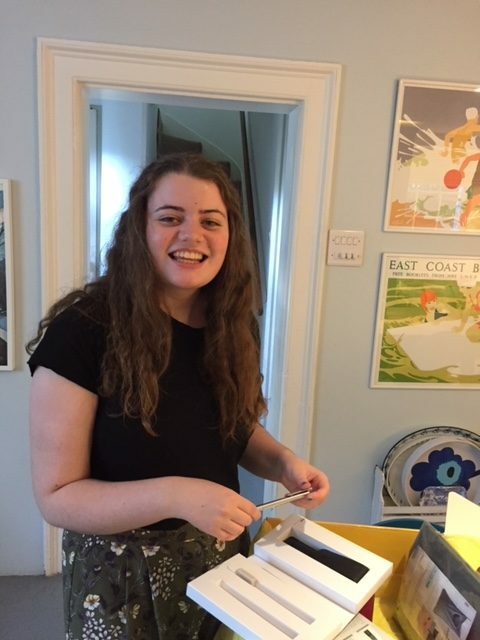 As you can see, my own Child 2, who will be going into her second year at uni come October, was pretty pleased with the treasures she uncovered. Not surprising, as these included a swanky Lamy pen set, a nice wooden picture frame (essential for all those pics of your mum you’re definitely going to want to have dotted around your room), tea bags, hot chocolate, instant coffee (not totally sure about that one), a no-nonsense cookery book and a very handy student life guide. 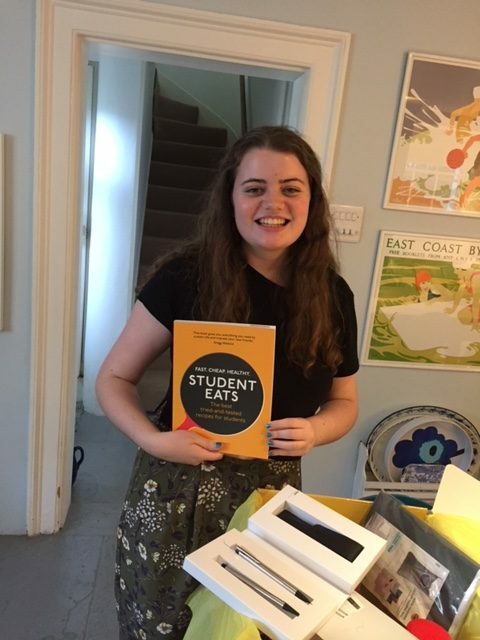 I pointed out to Child 2 that, as she’s living outside the embrace of student halls this year, and will be in her very own flat with friends, it might be quite useful to acquire a few cookery skills. I think a lot of the objects in the kit will prove much more palatable than my advice. And the laundry bag, with suckers to attach it to your door so it doesn’t take up floor place, is definitely a very useful addition. So, if you’re hesitating over a parting gift for the fresher in your family, give it a go. At least you’ll know they can definitely get their hands on a cup of tea over the next few months (kettle not included! ).